Beginning October 1, 2018, OSHA launched a regional emphasis program (REP) focused on reducing employee exposure to fertilizer-grade ammonium nitrate (FGAN) and agricultural anhydrous ammonium. The REP will be effective in Arkansas, Kansas, Louisiana, Missouri, Nebraska, Oklahoma, and Texas. OSHA states that the REP will begin with a 90-day period focused on education and prevention outreach to encourage employers to bring their facilities into compliance with OSHA standards. During this period, OSHA says it will continue to respond to complaints, referrals, hospitalizations, and fatalities. Enforcement activities will begin after the outreach period and run through September 30, 2019, unless extended. FGAN is a nitrogen-containing fertilizer. It is also an oxidizer that in the presence of combustible materials presents the risk of explosions and fires. The most notable FGAN incident is a 2013 explosion and fire at a fertilizer plant in West, Texas, that resulted in 15 deaths, injuries to members of the community, and extensive damage to the facility and surrounding homes. Following the incident, OSHA cited the owner of the facility for violations related to hazards associated with improper storage of FGAN under 29 CFR 1910.109(i). Storage buildings must have adequate ventilation or be of a construction that will be self-ventilating in the event of fire. All flooring in storage and handling areas must be of noncombustible material or protected against impregnation by FGAN and must be without open drains, traps, tunnels, pits, or pockets into which any molten FGAN could flow and be confined in the event of fire. Containers of FGAN must not be accepted for storage when the temperature of the FGAN exceeds 130° F.
Warehouses must have adequate ventilation or be capable of adequate ventilation in case of fire. Height or depth of piles must be limited by the pressure-setting tendency of the product. However, in no case may the FGAN be piled higher at any point than 36 inches below the roof or supporting and spreader beams overhead. No more than 2,500 tons of bagged FGAN may be stored in a building or structure not equipped with an automatic sprinkler system. Suitable fire control devices, such as small hoses or portable fire extinguishers, must be provided throughout the warehouse and in the loading and unloading areas. Water supplies and fire hydrants must be available in accordance with recognized good practices. 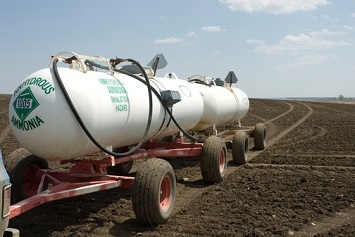 OSHA provides guidance on the storage and use of FGAN in the fertilizer industry at https://www.osha.gov/dep/fertilizer_industry.